Edna was born into a large Victorian family. Her father, Benjamin Waugh, was a Non-Conformist minister who was so appalled by social conditions of the poor and the abuse of children in England that he devoted his life to its improvement and founded the National Society for the Prevention of Cruelty to Children. Her husband, William Clarke Hall, was an associate and radical lawyer who developed modern English Child Law much of which remains as a standard legal reference today. 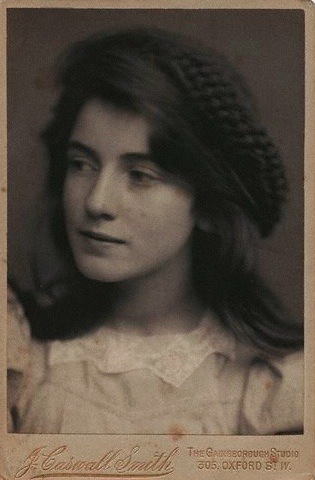 However their early marriage, when Edna was only nineteen, became a frustrating yoke both to her career and her intense yearning for love which provoked the themes of much of her romantic art and poetry. It also produced two sons, Justin and Denis, who she was devoted to in both maternal and artistic endeavour: her many sketches of their family life form the core of the lighter side of Edna's art. As a child, after only a few unhappy days attending a local school, Edna's mother recognised the depression caused in her daughter and allowed her to be educated at home. Edna's spirit remained unbroken and her burgeoning talent in art became clear. When only fourteen Edna entered the Slade School of Art at University College London and became its leading prize-winning female student. Her artist friends among others were Gwen and Augustus John, Ida Nettleship, Michel Salaman, Gwen Smith, Ambrose McEvoy, William Orpen, and Albert Rutherston: all of whom trained under the rigorous and watchful eye of their traditional drawing master Henry Tonks, high priest of the Slade and upholder of its standards for decades. Such an introduction to the rigors of traditional draughtsmanship, with its emphasis on economy of line, provided each with a solid base to develop their own styles and modes of work, limited only by their determination, genius and (particularly for the women) other (family) commitments. Edna was always candid and spontaneous. Painting with oils was too painstaking: drawing and watercolour was her natural habitat and she often depicted like a trigger-happy photographer 'capturing the moment' but she could also draw like the masters she learned from and equal them in pictorial power. If her plein air sketches sometimes resemble impressionist photos, her darker more intense subjects could be by Blake, Fuseli, Rossetti or Millais. That is not to say they would be confused as the work of these masters simply that, at their best, they are as strong and convincing - but from the hand of an outstanding female artist. The figure that Edna most closely identified herself with was Catherine Earnshaw from Emily Bronte's Wuthering Heights - imagine her as a prolific and accomplished artist and poet . . . 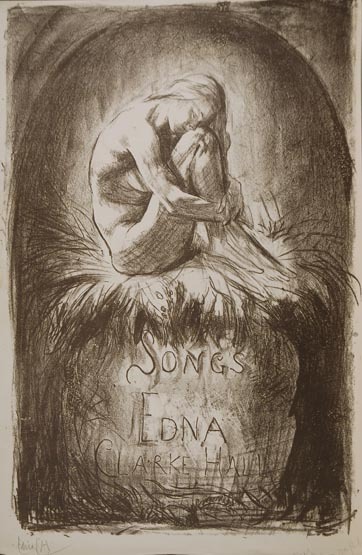 In fact if we consider Emily Bronte and William Blake we get very close to Edna's Songs (title-page below).